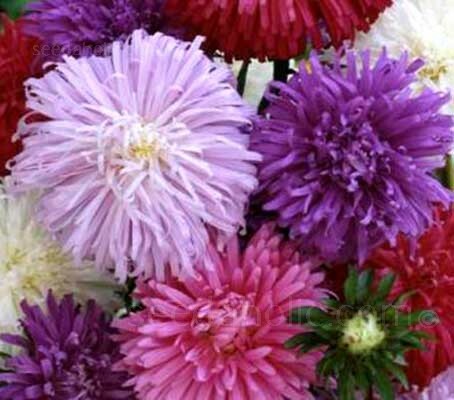 Callistephus chinensis, commonly called China aster, is a popular annual that provides showy, 3-5-inch diameter blooms from early summer to autumn on plants clad with ovate, toothed, medium green leaves. These fast-growing plants produce large, fireworks-like blooms in shades of pink, purple, red, magenta and white that are ideal in arrangements. Callistephus chinensis 'Ostrich Feather' produces voluptuous, blooms of re-curving, petals in rich boudoir colours. It is an old variety, grown for cut flowers in Victorian times that are, once again becoming very fashionable. It produces large, vigorous heads of flowers with attractively curled interlaced petals in a blend of lovely shades, including violet, pink, red, crimson, lavender-blue and white. Blooming from late summer to well into autumn, Asters are invaluable for beds and borders,and make an excellent cut flower. These fabulous flowers are easy and fast to grow and are quite irresistible to butterflies and bees.